David Boyns and Diane Stephens proudly display their Patriot Awards. Photo courtesy of Danielle de Asis. In April, U.S. Department of Defense officials presented California State University, Northridge sociology professor David Boyns and Associate Vice President of Academic Resources and Planning Diane Stephens with the Patriot Award. 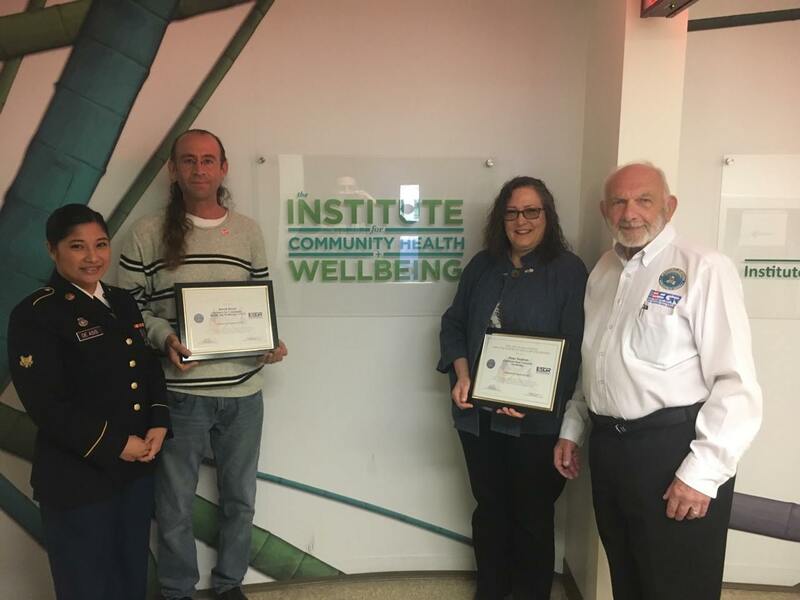 Government officials recognized Boyns and Stephens for their support of Danielle de Asis, a CSUN employee of the Institute for Community Health and Wellbeing who serves with the U.S. Army National Guard. The Patriot Award was established by the Employer Support of the Guard and Reserve and is given to employers who support citizen warriors through measures including flexible schedules, time off before and after deployment, and granting leaves of absence if needed. De Asis, who nominated Boyns and Stephens, said they deserved the award for the accommodations they made and the support they offered when she had to take a three-month leave from the university in 2015 for bootcamp and a two-month leave in 2016 to complete her advanced individual training. The award came as a complete surprise to Boyns and Stephens. De Asis, who has access to Boyns’ calendar, had penciled in the ceremony as a department meeting at Santa Susana Hall on campus. A representative from the U.S. Department of Defense presented the award to Boyns and Stephens. Boyns said he was moved by de Asis’ nomination. Stephens knew that Boyns was getting the award and headed over to Santa Susana Hall to attend the ceremony. She said she was shocked when she was given the second Patriot Award of the day. Patriot Awards are presented to individual supervisors, not to an entire staff or institution, but Stephens said that the many other CSUN colleagues who helped de Asis also deserve credit. “The most important thing that’s going on here is that the university is supportive of its employees,” Stephens said. “I really haven’t done anything.